I was just on Periscope, the streaming app owned by Twitter. The running count for number of live followers on my session dropped from over a thousand to zero for no obvious reason, even though plenty of people were still on and interacting with me. At a count of over a thousand viewers I would have been close to the #1 stream on the app at that moment. I restarted the session in case it was a technical error. Once again, as soon as I started talking about how Trump could win the race, my viewer count artificially dropped to zero, while at the same time there were plenty of actual people on my session interacting with me. 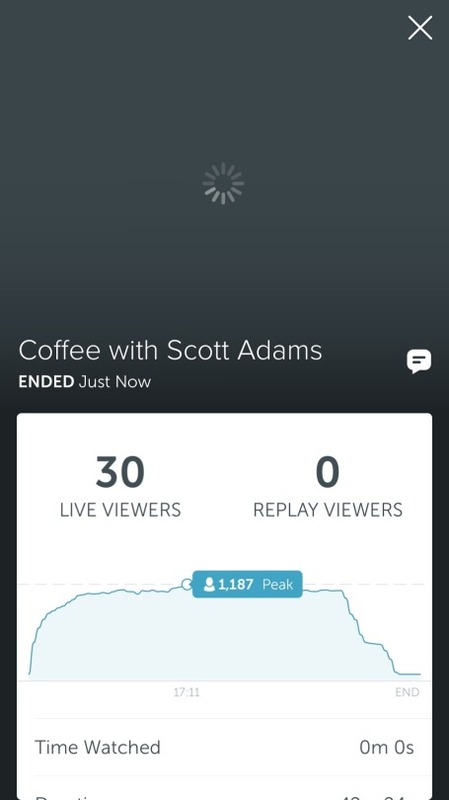 A high viewer count is what makes a Periscope session look appealing to other viewers. The sessions with a lot of viewers get featured and attract even more viewers to see what is happening. Whatever suppressed my viewer count had the effect of reducing the number of new people coming to see me. I don’t have confirmation that Twitter is shadowbanning me. All I know is that my followers say they don’t always see my posts unless they go to my feed directly. Hundreds of people might be wrong (it happens) but the odds are against it. 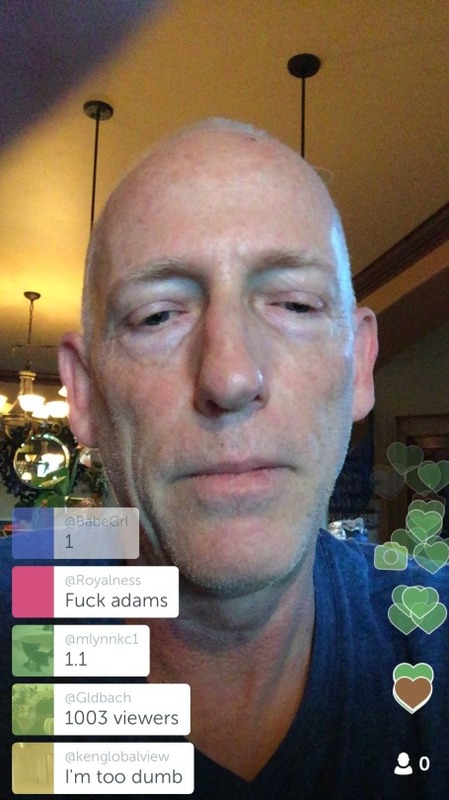 Likewise, my problem with Periscope might be a technical glitch. (It happens.) But again, that would be a large coincidence. As I said before, if Twitter is suppressing my political speech, I consider it moral treason against the people of the United States even if it is allowed under their terms of service, and even though it is technically legal. I hope I’m wrong, and that my problems are simply technical in nature. Because if Twitter is doing what people say they are doing, and suppressing certain types of speech, the company needs to die for the good of the Republic. And I trust that it will. The part of the Periscope session that got shadowbanned (maybe) was where I said all Trump needs to do to win is display a detailed understanding of the PROCESS of handling the nuclear codes, but using only public sources. That would demonstrate that he is serious and understands the gravity of it. The public needs to know he takes it seriously. But Trump would also need to use what I call the “high ground maneuver” to frame his critics as people who think offensive words are as important as nuclear war. Sure, Trump sometimes says things that are politically incorrect, but our adversaries in the world know what they are getting with Trump. They have televisions. No one will be surprised by anything he does. And Trump could point out that he has a lifetime of experience making important decisions under pressure. Say directly to the American people that they are safe with him in control of the military arsenal. We also have some recent news that changes the frame from Trump supporters being dangerous to Clinton being dangerous. Project Veritas showed us that Clinton allies incited the violence at Trump rallies. We heard Vice President Biden say he wanted to take Trump behind the bleachers and beat him up. And we observe Clinton provoking Russia at every opportunity. That all sounds dangerous to me – at least enough to change the frame. If you talk to Clinton supporters about why they are afraid of Trump, about half of the problem is their concern about his “temperament” and the nuclear codes. That comes from Clinton’s persuaders doing a good job of making the case that Trump’s choice of words indicates he would be dangerous with the nuclear codes. If Trump addresses that illusion directly, he removes the biggest fear that people have about him. If you like freedom of speech, you might like my book because you also like coffee.